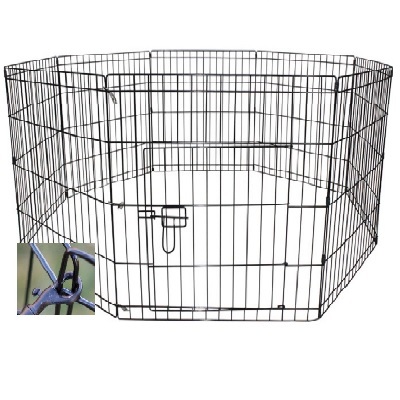 Helps Keep puppies safe whilst unattended. Folds down and sets up in seconds. Safe and secure slide bolt latch on door for your dogs safety. Finished in black for easier cleaning and anti rust. Solid and Safe for your Pet. Made to ISO9001 2000 standards for Quality Assurance. Our puppy pens can be set to various different shapes. Our website will give you an indication of the carriage charge for your order. Please note this is a guide price only - we will contact you via email in the event that the carriage guide price is insufficient. You will then have the opportunity to either cancel or proceed with your order.